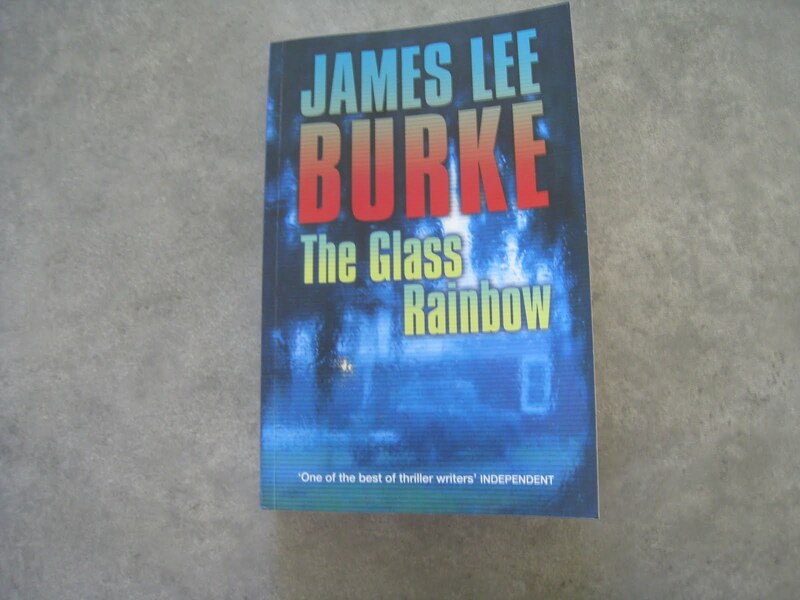 The Little House of Concrete Bookshelves: James Lee Burke "The Glass Rainbow"
Eighteen titles, twenty-three years and the Dave Robicheaux series is still going strong, though The Glass Rainbow has the New Iberia detective picking up ominous signs. I've seen suggestions that, with Robicheaux and long-time associate Clete Purcel seriously wounded at the end of the story this may well be the end of the series, but I'd counter that with an if Dave Robicheaux's dead how come we're getting a first person narrator? There are a couple of things that come in handy when you're looking at an extended series of crime fiction, and James Lee Burke continues to tick most of those boxes along the way. For a start, in the absence of the long term good guy/bad guy scenario you find operating between Ian Rankin's Rebus and Big Ger Cafferty or Graham Hurley's Joe Faraday and Bazza McKenzie you need an on-going ability to roll out convincing psycho and sociopaths. While you'd think that Burke could roll these characters out in his sleep bestselling celebrity ex-convict author Robert Weingart is right up there with the best of his villains, pulling the strings and manipulating those around him a Robicheaux digs around the latest in a series of brutal murders in neighbouring Jefferson Davis Parish. Then there's the psychotic Vidor Perkins, a truly nasty piece of work who gets his comeuppance in a salutary manner shortly before a close Robicheaux escape from the same fate at the hands of a ruthless batch of hired hands. Or pimp/crack dealer Herman Stanga, beaten up by Clete Purcel and subsequently shot beside the swimming pool that's the only attractive feature of his increasingly dilapidated residence in a previously upmarket neighbourhood. Most authors would probably draw a line around there but Burke goes further. There's novelist and scion of local local landowning family Kermit Abelard, who's become involved with Robicheaux's stepdaughter Alafair, who's in the process of embarking on a literary career. You can add local boy made good investment tycoon Layton Blanchet, on the verge of going under in the wake of a Ponzi scheme, his scheming wife Carolyn, who's got form relating to Robicheaux's boss Sheriff Helen Soilau and Mississippi prison gun bull Jimmy Darl Thigpin to that little array of nasties. Thigpin inconveniently disposes of a black convict whose sister, high school honour student Bernadette Latiolais is one of the seven women who have been brutally murdered. in the neighbouring county. Given the wealth and quality of villains in the area, I tend to start a new James Lee Burke with an intention to explore the story a chapter or two at a time in a limited bit by bit strategy. Inevitably, however, the narrative drags you in to polish the rest of the story off is a flurry of reading activity. You want to take your time, savouring Burke's seamless prose without overdosing on the thugs and low lives and end up churning through the pages to see how it all works out. Another factor in the continuing series side of things is a certain degree of timelessness. Do the maths. Robicheaux and Clete Purcel served in Vietnam. You're not sure when, but given the fact that they started Vietnamization after January 1968's Tet Offensive and US forces were gone from the country by 1973, thirty-six years later those who served in Vietnam are going to be pushing sixty, hardly the age to be living the Clete Purcel lifestyle or engaging in running gun battles. Burke describes the way it went down in the year 2009, but apart from that and passing references to a hurricane that could provide a point on a timeline there isn't much to date the story. People use mobile phones, there are issues when they're out of range and a couple of references to the internet, but they've been doing those things for a good fifteen years now, and an absence of other specifics makes it easy for the reader to avoid having his or her attention drawn to things that mightn't quite add up. But more than anything else the would-be author of a lengthy crime series needs a setting that will accommodate a variety of plot lines, the authorial skills to carry it off and, almost invariably a strong moral element in the protagonist's commitment to getting to the heart of the matter. Michael Dibdin's Aurelio Zen might be a time server who keeps getting into matters he'd prefer not to become involved with along the way but he's operating in a society where corruption and individual shortcuts are an accepted way of getting through everyday life. When it comes to societies teetering on the edge of dysfunction it's hard to come up with a better long term example than Louisiana, where the issues that came to light in the days after Katrina were expressions of long standing social divisions that come directly out of the region's history and will, more than likely still be there in a century's time. An awareness of that history, and a righteous indignation at continuing injustice is the main motivation that drives Dave Robicheaux, and when he's called to interview a convict on a chain gang it trips off a chain reaction that draws the reader in as Robicheaux struggles with his stepdaughter's involvement with Kermit Abelard who's ten years older and also closely involved with the manipulative Robert Weingart. Robicheaux's reaction to the relationship might be seen as the response of an over-protective parent, but there's definitely something there from the earliest stages of the story that doesn't quite add up. And doesn't quite add up is probably a fair assessment of Clete Purcel's continued survival, having broken most of the rules and seemingly avoided official or unofficial retribution. Robicheaux, of course, is inclined to ascribe that survival to fear on the part of the Mob and the hapless army of miscreants that dwelled like slugs on the underside of the city based on a recognition of Purcel's unwillingness to obey rules or recognize traditional protocol but as he continues to wreak random havoc through the narrative the reader is left scratching his head on the basis that Clete's run of luck can't last forever. But, of course, it does, even if it means a serious wound as he takes out a bunch of skilled operatives who've been together Senegal to South Africa, Uzbekistan to the Argentine. Some readers may take issue with the fact that the story ends shortly thereafter without a neat tying together of the various threads, but that's fine with me. While we don't have all the details of the two killings that provided Robicheaux's motive to go digging we're pretty sure of the who and the where, and there's a fair chunk of why taken care of as things get shaken out. 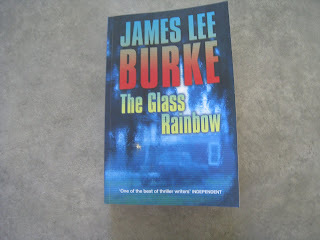 There's nothing much that's new or different here, but The Glass Rainbow gives the reader another chance to roam through Burke's fictional world, and as a long-time fan with an interest in most things to do with Louisiana I have to admit a reluctance to actually experience the Gulf coast environment.